If you are attached to the surface of the glass or ceramic tile, because of its relatively smooth material, it is best to use a clean rag before the paste to dry the veneer, it is easier to paste, and the formation is better;. Bathroom Supplies. Kitchen Supplies. Fix a corner at first, let a small part of the backing paper separate from the transfer film and keep the sticker on the transfer film. If the sticker is not transferred to the transfer film, you can use a utility knife or finger to separate the sticker from the backing paper. Unsuitable in Off ash wall, Concave wall and Bumpy wall. 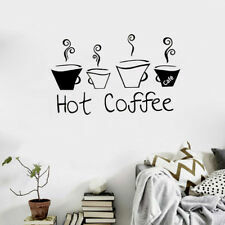 1Pc Art Decor Wall Sticker. -Apply to furniture (refrigerator, table, desk, kitchen cabinets, drawers, etc). -Gently peel off the sticker from the backing paper. Where to apply : Stickers will stick to any smooth surface such as ; walls, doors, glass, cabinets, appliances, etc. - Anywhere you want ! 1 x Wall Sticker. we will give you a satisfied solution as soon as possible. 1 x Wall Sticker. Where to apply : Stickers will stick to any smooth surface such as ; walls, doors, glass, cabinets, appliances, etc. - Anywhere you want ! High quality in EU and US quality standard. Can be applied to any smooth and clean surfaces such as walls, doors, windows, closet, etc. Show your creativity by turning your wall into a beautiful work of art with wall art decals. Note: This wall sticker can be re-used on smooth wall and surface. Because of the low temperature of air transportation, wall stick's viscosity will decline. how to use: 1. Peel off from backing paper 3. Apply to the surface as picture shown 4. Press firmly to squeeze out any air bubbles. Can be applied to any smooth and clean surfaces such as walls, doors, windows, closet, etc. Material: Vinyl. We will do our best to solve your problem. Size:31 18.7cm. It can be easily applied in minutes and removed. Can be applied to any smooth and clean surfaces such as walls, doors, windows, closet, etc. Material: Vinyl. We will do our best to solve your problem. It can be easily applied in minutes and removed. Style: Coffee cup. What You Get:1 x Wall Sticker. If you are satisfied with this product. (we know leave negative can deal nothing!). We work very hard to exceed your expectations. However we will try our best to replay in 24hours! 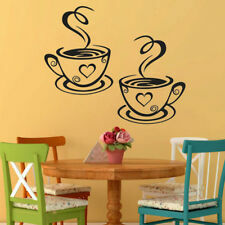 Coffee Cup Vinyl Wall Stickers . Pattern:Plane Wall Sticker. DIY Decoration:Vinyl Wall Sticker. Classification:For Wall. Bathroom Supplies. Can be applied to any smooth and clean surfaces such as walls, doors, windows, closet, etc. Kitchen Supplies. Wipe down the sticker gently in a wiping motion to eliminate air bubbles. Cake Mold and Ice Mold. Custom Wall Stickers & Sticker. Kitchen Tools. Car sticker. Material: Vinyl. Product View. Application:Living Room / Bedroom / Office / Kid Room etc. Classification:For Wall,Furniture Stickers. ShapeCoffee Cup. DIY Sticker:Removable Fashion Wall Decor. Removable Wall Sticker. Type:Wall Sticker. 1 Wall Sticker. Type: As shown in the pictures. the import duties in case that occurred for certain goods. It can be applied to any smooth, clean and dry surface. so that we can make sure you get the item safely. Trending at C $5.01eBay determines this price through a machine-learned model of the product's sale prices within the last 90 days. Theme:coffee cup. Theme:coffee cup. Package Includes:1 x Wall Sticker. Where to apply : Stickers will stick to any smooth surface such as ; walls, doors, glass, cabinets, appliances, etc. - Anywhere you want ! 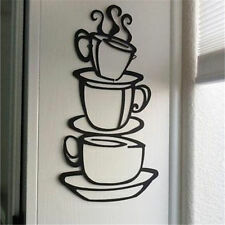 1 x Coffee Cup Wall Art Sticker. Due to the light and screen difference, the picture may not reflect the actual color of the item. To Other Country. Orders placed on weekend will. Ideal for dry, clean, and smooth surfaces. Where to apply : Stickers will stick to any smooth surface such as ; walls, doors, glass, cabinets, appliances, etc. - Anywhere you want ! 1 x Wall Sticker. We will response in 24 hours to resolve the problems. Can be applied to any smooth and clean surfaces such as walls, doors, windows, closet, etc. 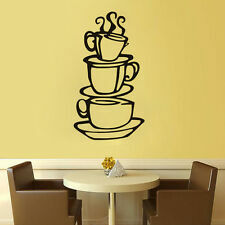 Tip: This wall sticker can be re-used on smooth wall and surface. Stick the sticker gently and directly to the bottom paper, without transferring the film. 1 x Wall Sticker. Where to apply : Stickers will stick to any smooth surface such as ; walls, doors, glass, cabinets, appliances, etc. - Anywhere you want ! Note:The real size depends on the product. Colors:(As picture show). Rate (item arrived). Canada Rate (item arrived) 0.0% 47.1% 31.4% 17.6% 3.9%. Your understanding will be greatly appreciated. Where to apply : Stickers will stick to any smooth surface such as ; walls, doors, glass, cabinets, appliances, etc. - Anywhere you want ! Note:The real size depends on the product. Kitchen Squirrel Shape Rice Paddle Scoop Spoon Ladle Novelty Kitchen Gadget - SS. Acetone Polish Remover Alcohol Liquid Oil Portable Pump Dispenser Bottle - SS. Skull Shape 3D Ice Cube Mold Maker Bar Party Silicone Halloween Mould Gift SS.